As reported by the U.S. Department of Agriculture, food is generally considered to be a “normal good,” meaning that the demand for it increases as income increases. Given this, it should not be surprising that higher-income areas typically have relatively more grocery stores and restaurants than are found in lower-income areas. 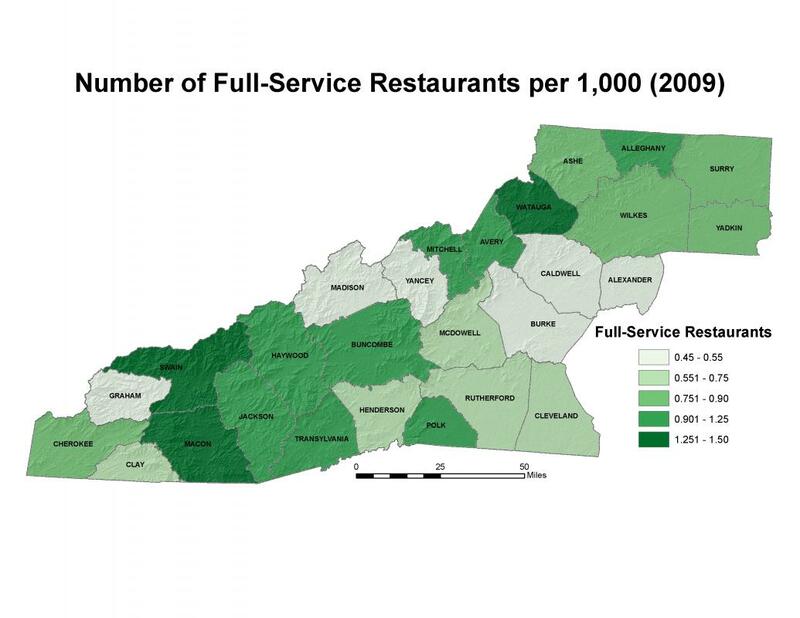 With this in mind, and with a median income well below state and national estimates (see Economic | Income | Income), it could be expected that the Mountain Resources Commission (MRC) region would have fewer grocery or full-service restaurants per 1,000 people than the rest of the state. However, this is not completely evident from the data presented, as low population densities found in many MRC counties make the rate of stores or restaurants per 1,000 people appear higher than expected. The MRC region contains many rural communities and few major metropolitan centers, and includes areas isolated from much of the rest of the southeast due to the prevalence of mountainous terrain. The MRC region’s predominantly rural environment, coupled with a lower median income level as compared to state and national levels, combine to increase the hardship an average individual in the region may have in accessing affordable and healthy food options. The “food environment” of each community influences residents’ access to healthy foods and provides the potential for community members to lead active, healthy lives. The stability of a food environment in a community is affected by many factors, including grocery store and restaurant proximity, food cost, food and nutrition assistance programs (such as the federal Supplemental Nutrition Assistance Program, or SNAP), transportation infrastructure, and community characteristics, among others, and is used to measure the access a household or individual has in obtaining nutritionally adequate foods. Food price, also a major determinant affecting an area’s food environment, is often a product of commodity prices, energy costs, and transportation costs, and can be subject to larger-scale economic pressures or even weather events. Faced with budget constraints, lower-income consumers commonly replace higher-priced foods with lower-priced alternatives (e.g., canned fruits for fresh fruits, or frozen vegetables for fresh), which strongly affects their food preferences and dietary decisions. Additionally, in rural areas there may be a disproportionately higher economic burden for lower-income consumers, as access to high-volume discount retailers (where prices tend to be competitively lower) is limited. Limited access to nutritious food and relatively easier access to less nutritious food may be linked to poor diet and, ultimately, to obesity and diet-related diseases. Consider the dining options a family may have in a particular part of the region – a full-service restaurant or a more affordable fast-food restaurant? Lack of access to healthy food can make a healthy lifestyle difficult to maintain, and can lead to health risks, including obesity. In places where fresh and nutritious food is not available in grocery stores or farmers’ markets, people will rely on fast food restaurants and convenience stores, and these offer few healthy options. Note, however, that while a lack of access to healthy food is a contributing factor to obesity, the MRC data do not show a direct correlation. 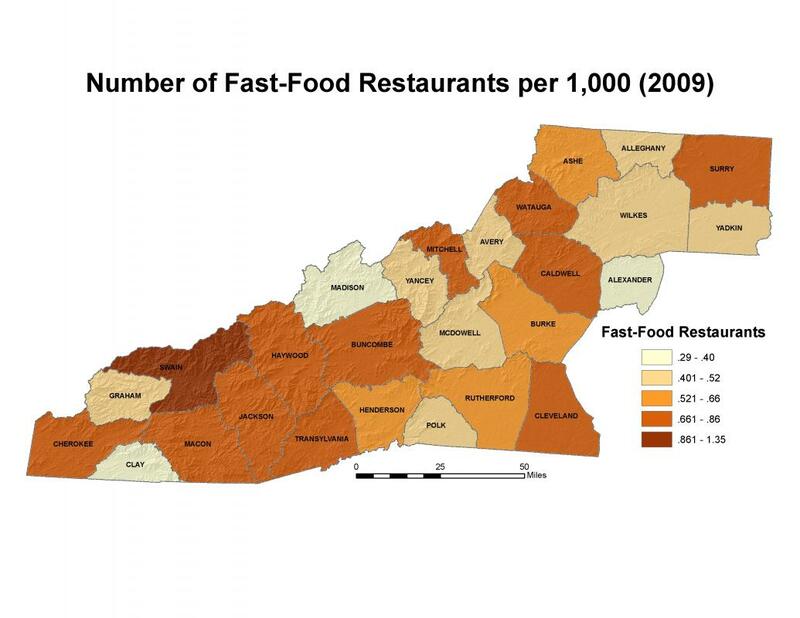 While Buncombe and Watauga counties have higher numbers of fast food restaurants compared to other counties, they have some of the lowest obesity rates (see Obesity and Diabetes). Since much of Swain County is public parkland in the Great Smoky Mountains National Park, its population is low. However, the county serves as a gateway to the park, which attracts a high volume of people. 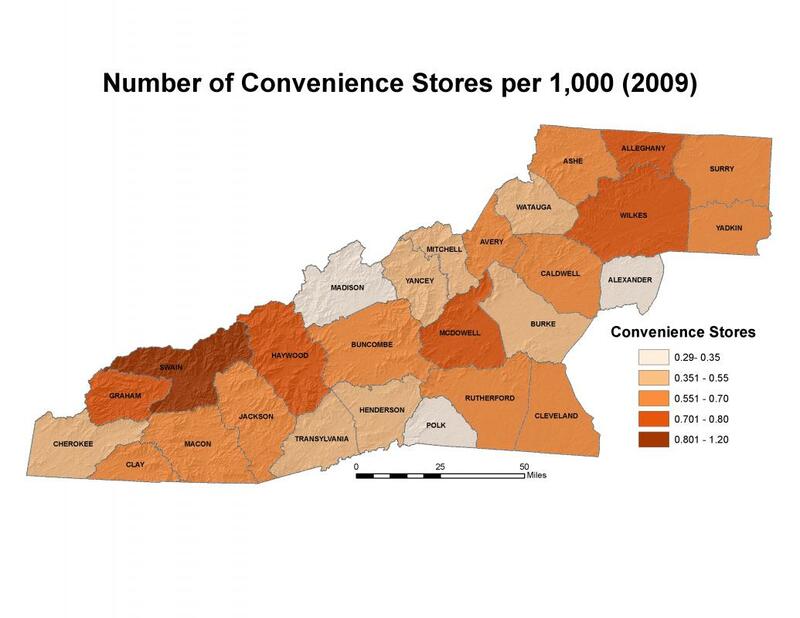 These visitors create a higher demand for fast food and grocery stores than would otherwise be present with Swain County’s resident population. Swain County has a high obesity rate that could be tied to its large number of fast food restaurants relative to its smaller population size. However, it also has a large proportion of grocery stores, which would offer healthier eating options. 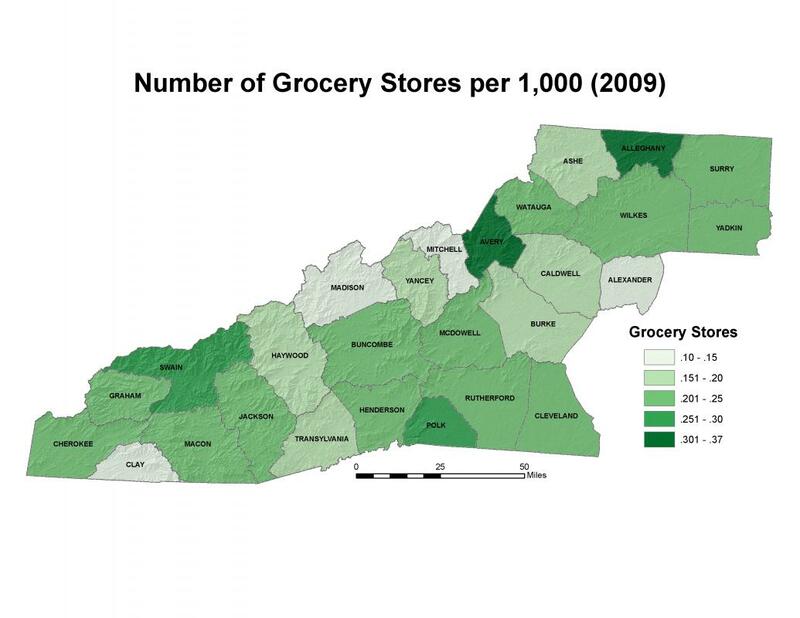 For more information about food security issues in the Western North Carolina region, see Human | Food Security Overview and subsequent metrics in the Human | Food Security section of this website. U.S. Department of Agriculture. Access to Affordable and Nutritious Food: Measuring and Understanding Food Deserts and Their Consequences. Report to Congress. Washington: Government Printing Office, June 2009. Accessed from: http://www.ers.usda.gov/media/242675/ap036_1_.pdf. U.S. Department of Agriculture, Economic Research Service. 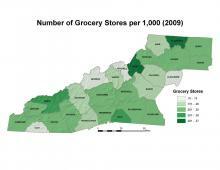 Food Access Research Atlas. Accessed from: http://www.ers.usda.gov/data-products/food-access-research-atlas.aspx#.Ue6LCmRAQvs. U.S. Department of Commerce, United States Census Bureau. County Business Patterns. Accessed from: http://www.census.gov/econ/cbp/.